Smoked foods are popular all over the world, but most of us don't have smokers at home. If you want smoked salmon, brisket or Gouda, you usually have to go out and buy it. Outdoor smokers aren't usually an option for city-dwellers, and the indoor versions can be pricey. If you want to experiment with smoked food at home, but don't want to commit to buying a real smoker, you can make a stovetop version with a few basic kitchen items. It won't taste exactly the same as food that's smoked all day, but it will add a light smoked flavor and takes a fraction of the time. 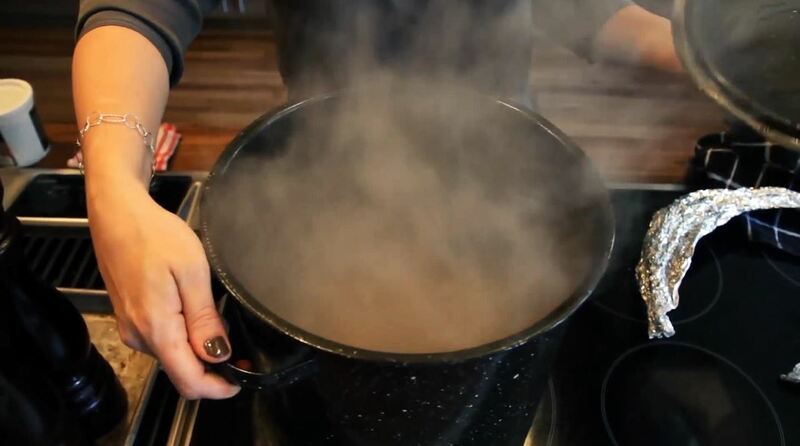 Saveur executive editor Dana Bowen has a super simple method for building a stovetop smoker with just a large pot, a metal steamer insert, aluminum foil, and some wood shavings. It's a lot like turning a wok into a smoker, but less wasteful of tinfoil. All you have to do is line the bottom of the pot with foil, add some wood shavings, cover them with another layer of foil, and set the steamer insert on top. To use it, place your food on top of the steamer, cover the pot and tightly wrap the edges with foil to keep all the smoke inside. Cook over high heat for about 5 minutes, then on medium-low for another 10-15 minutes for small cuts or 30-40 minutes for larger cuts. After cooking, remove from the heat and let it rest for 10 minutes or so. Depending on the size of the cut, it may not be done after cooking in the smoker. If it's not cooked through, just transfer it to a pan and finish it off in the oven. Do you have a DIY smoking setup in your kitchen? What kind of wood chips do you like best with it, and what kinds of foods do you usually cook with it? Share your methodology with us! does it work in aluminum pot?